It is essential to know which drive you have before ordering your upper gearcase. 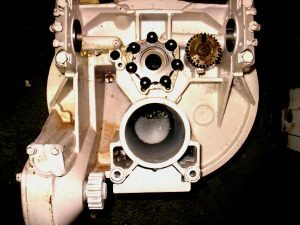 If the wrong worm gear is installed on your boat, the steering will be reversed. When turning the steering wheel clockwise (right), the boat will turn left, and when turning the steering wheel counter-clockwise (left), you will turn right. 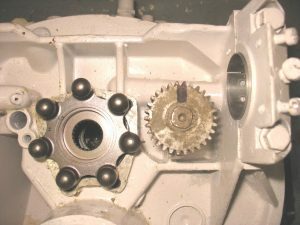 Remove the upper and lower gearcase from the intermediate housing. Standing behind the boat, looking toward the intermediate housing (as shown in figure 1). Locate the small steering gear to the right of the ball gear. Have someone turn the boat's steering wheel clockwise. 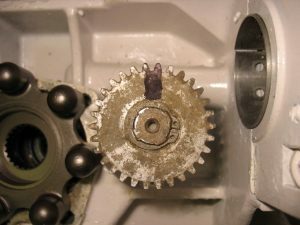 If the steering gear (shown in photo with black stripe on gear) turns clockwise, you have a right hand worm gear. Again, turning the boat's steering wheel clockwise, check the rotation of the steering gear (shown in photo with black stripe on gear). If the steering gear rotates counter-clockwise, you have a left-hand worm gear.